With kids heading back to school, it’s starting to feel like summer is almost over. I’m not sure if I’m quite ready for that! 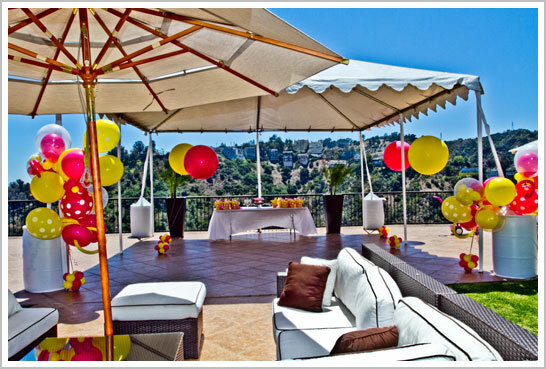 So I thought we’d bask in the sun just a little bit longer with a party that is all about sunshine! From the sun streaming down on a gorgeous day in Hollywood Hills to the vibrant color scheme of hot pink and golden yellow. Not to mention the sweetest little sunshine of all, Madison, the birthday girl! 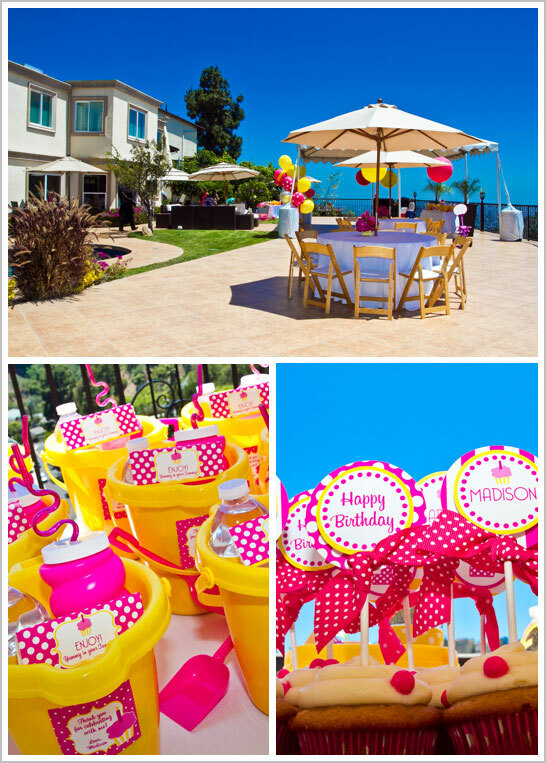 Sent over to us by Auntie Monica, this party is both cheerful and bright! 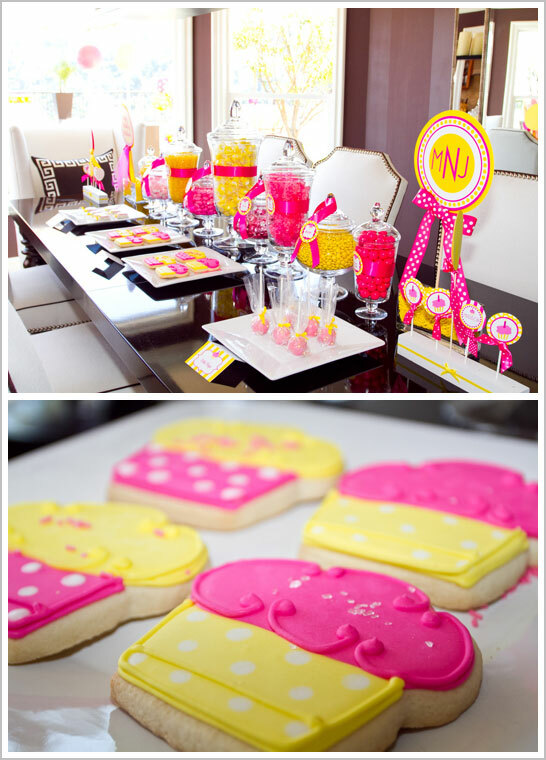 Featuring a candy buffet to make you drool, check out this My Lil Sunshine 1st Birthday Party. How adorable are these cookies by The Cookie Jar? I absolutely love the little sprinkles on the ‘cupcake icing’! And the candy buffet is truly over-the-top fabulous! Along with the gorgeous dessert bar and cookies, guests were treated to a brunch and a signature mimosa bar, where they were able to toast and indulge! And of course, there was the breathtaking view to enjoy as well! Don’t you just want to jump into these photos? What an amazing day, in every way! A very special thank you to Monica for sharing this My Lil Sunshine 1st Birthday Party with us! So cute!! This party is absolutely gorgeous!!! Love the cupcakes and dessert tables!!!!! Perhaps these are better for adult parties. Does anyone make them in plastic? I have found that adults as well as children love candy/dessert tables. 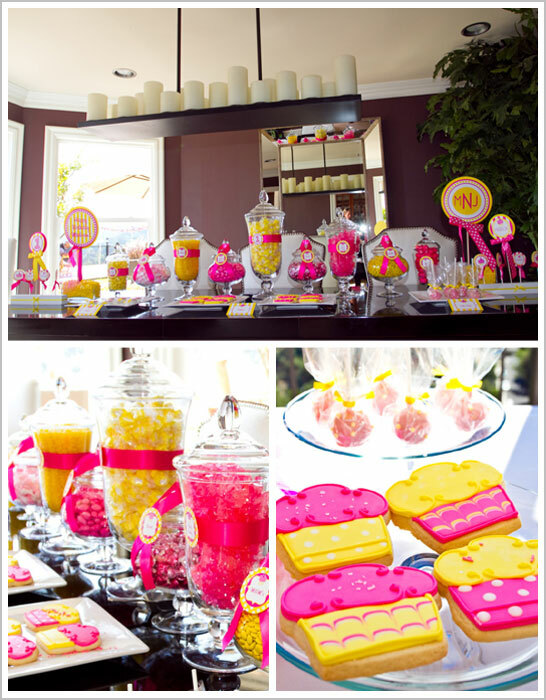 The candy and or desserts that are included on the table are a great party favor for both adults and kids. If glass jars are used at a party with children, I open the jars before the end of the party so that there is not a concern regarding any breakage. If you do not want to purchase apothecary jars you can use either square or round flower vases. There are also companies that can design a signature candy bar if you do not want do it yourself. Another tip is to get larger candy bags if you also have desserts such as cake pops, cookies, etc. that you would like guests to take home. If I have cupcakes on the dessert table I also have chinese take out boxes available for the guests to take their cupcakes home as well. What a beautiful color scheme! I LOVE all the sweet treats!! This was an amazing party with intricacies most would not begin to think of. Color scheme was gorgeous ….. thanks for sharing! Wow! This is amazing- an artful attention to details! What all did you put inside the buckets? i love that idea! !